Twilight Gift Card from Borders: This is great because it shows that you know what she like but also allows her to pick out a gift of her choice. It’s also nice that you can choose how much you want to spend. New Moon Fandango Gift Cards: Again these allow you to get mom something that shows you pay attention to her interests but then also allow her to buy movie tickets for something else in the future (perhaps Eclipse?). If you are lucky, maybe she will even take you. Choose from a couple of different New Moon designs. 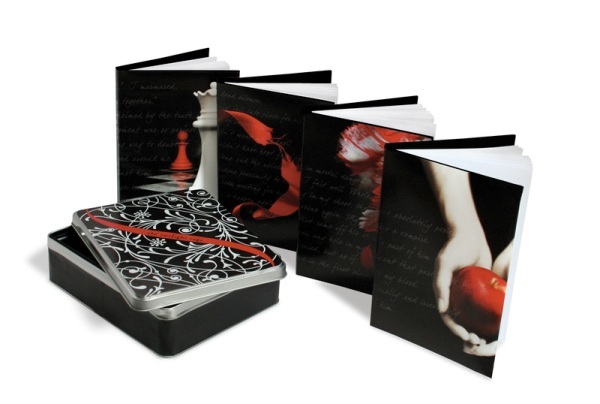 Twilight Journals. Although mom may or may not use these as a traditional “journal,” she can still get a lot of use out of them. She can throw one in her purse to have ready when she wants to take notes. Or maybe she just wants to keep one by the phone for messages? These are now available in many different places both online and locally. Twilight Woods Collection from Bath & Body Works. Although it’s technically not official merchandise, it definitely has a Twilight feel to it that mom will appreciate. The scent is meant to be reminiscent of a “romantic walk in an enchanted wood” and it colored a little like Twilight. It’s a nice scent that appeals to most women. Nordstrom The Twilight Saga: New Moon for BP. ‘Bella’ Charm Bangles: Pretty much any of the jewelry from the Nordstrom New Moon collection would be a perfect gift for a Twilight mom. The jewelry is high quality but still affordable and a little more subtle than what you will find at Hot Topic. Customized Shirts from CafePress: The reason that I love the customized shirts at CafePress is that they are more nuanced than just the images of the movie character or the Twilight logos. For example, the shirt above with “Isle Esme” is just a tiny bit naughty with the feather but would also only be understood by other Twilight fans. You can choose from quotes from the movie or fun things like only fans would get (like “La Push Cliff Diving Team.”) Pick out a shirt that pertains to mom’s favorite part of the Twilight Saga and customize it in her favorite color and shirt style. Also check out the water bottles and Christmas ornaments there. While there are many different ideas for Twilight Christmas gifts, I think that any Twilight Mom would be thrilled with the gifts above (present company included)!